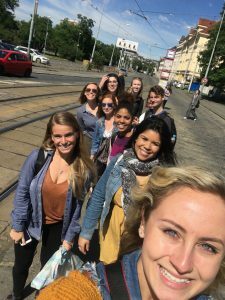 My study abroad experience in Prague was not one that I expected. When we first arrived in Czechia the group and I was surprised by our living situation, as we do not have connection to wifi and we are located away from the city center. Granted, we were not promised these things originally, but I think we as U.S citizens were so accustomed to having constant accessibility to the Internet and other modern luxuries that we were somewhat caught off-guard. The first few days were a bit challenging, as to be expected when becoming accustomed to a new city’s transport, customs and culture. After the culture shock lessened, I sensed a gratitude that my classmates were accepting of our extraordinary situation. Personally, getting used to not being on social media constantly was extremely refreshing. This experience allowed for me to make awesome connections with the individuals in my study abroad group, whom of which are now some of my best friends. It is my perception that if I had wifi and cellular data to utilize at my convenience that I would have missed out on completely submerging myself into one of the greatest experiences of my life to date. It is an extraordinary thing to be able to connect with individuals on a deeper level in today’s society due to so many modern distractions, and I am extremely happy that I was not a victim to that reality. I would highly recommend studying abroad to any student who is able. I would especially endorse this cross-cultural involvement to someone who is interested in gaining some worldly perspective and is enticed to cultivate their personal growth- all the while making lasting connections and great friends in a foreign country. There is no experience comparable, nor have I ever learned so much about myself, another culture and been so inspired by a course than I am now in Prague.